You’ve got a great business idea and a well-thought-out plan, but you still need a name for your new venture. While of course it’s important to pick a name that you like, there are also some practical considerations. In this guide, we’re going to walk you through these to give you a leg up and hopefully make the process of naming your LLC a bit less stressful. If you can’t successfully market your business’ name, that probably means you won’t successfully market your business – and that’s a problem. There are a number of different strategies to choose from, but they all have the same end goal, which is to make people recognize your brand and want to buy your products or service. Some of the best marketing plans tell potential customers at least a bit about who you are. That could be a core value your business prides itself in, a particular ingredient or material your products utilize, or countless other things. Tying one or two words related to what you do or how you do it into your name can be a good way to familiarize the public with your brand. It’s smart to choose a name that is short, easy to remember, and easy to pronounce. You don’t want people to struggle recalling your company’s name or be unsure if it is pronounced one way or another. Try to keep it simple. In addition to coming up with the right name, you’ll want a suitable web domain. Ideally, this URL will be the same as your company name or otherwise clearly recognizable, but there are other more-creative options if you decide to go that route. Coming up with a domain name that isn’t already registered is sometimes a frustrating process, but keep in mind that they can sometimes be purchased from their current owners. If possible, choose a domain ending in .com. While there are numerous options available, this one is still generally viewed as the most professional one. If you are ready to register your business with the state, but you can’t figure out the marketing or domain right this second, relax, you can consider using a DBA (doing business as) once you have it figured out. It must include the words "limited liability company" or the abbreviation LLC (in some cases just LC). It cannot use language that refers to other types of legal business entities, like "incorporated" or "corporation." It cannot refer to specialized services like banking, medicine, or law. 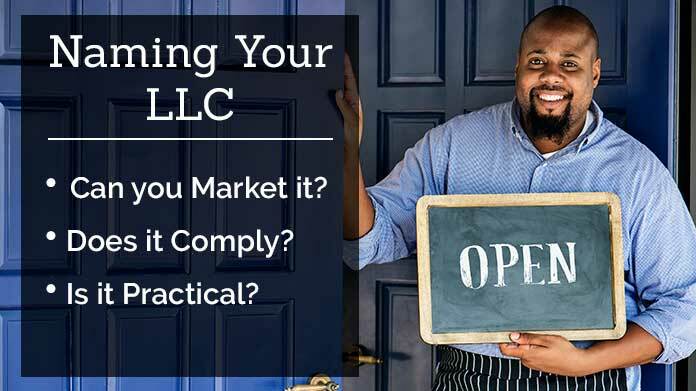 If you are planning to start a business that offers these services, you should look into forming a Professional LLC (PLLC). Another thing to consider is filing for a DBA. This allows your LLC to operate, or do business, under a different name. This can be useful in several different types of situations. One if these is if you would like to operate different businesses or offer separate services without having to form a separate business entity for each one. DBAs can also give you the flexibility to sell a popular product that you offer under a separate brand name or operate a separate website that might not quite match up with the name of your LLC. In addition to these advantages, a DBA can act as a sort of Plan B if your LLC’s name no longer fits the business or you develop a new and/or improved marketing or branding plan over time. It is important to note that, while DBAs can cut down on the amount of paperwork you may have to deal with compared to starting a separate LLC, you are still required to file federal and state tax returns for each one.